The University of Arkansas School of Law welcomes you to the Summer Pre-Law Program (SPPARK). SPPARK is a three-week, intensive, pre-law focused academic summer program for rising junior and senior college students -- and recent graduates -- interested in law school. SPPARK at the University of Arkansas School of Law will include LSAT preparation, academics, professional development, guest speakers and field trips. LSAT preparation will be provided by experienced instructors and will prepare students for maximum effectiveness on the LSAT. The academic program will offer skills to help students improve their performance in their undergraduate work across several disciplines. Courses offered in previous years include Legal Systems and Process, Legal Issues in Higher Education, Legal Communication and Oral Advocacy, Negotiations, and Constitutional Law. The professional development program will include off-site field trips and other formal mentoring programs with the local bar association and community members. These experiences will expose attendees to a variety of settings that first-generation students often lack during their undergraduate careers. Students will spend time with attorneys in an office setting and at court hearings. There will be informal gatherings where the students will interact with local attorneys, and the program will include financial counseling, time management and study skills courses, etiquette training, counseling on appropriate attire and a host of workshops aimed at improving daily and professional communication and listening skills. Instruction, meals and campus housing will be provided free-of-charge. If you prefer to secure your own housing arrangements in the Fayetteville area, you may do so at your own expense. Law student mentors will provide support to participants living on and off campus during the program. To be considered for SPPARK 2019, you must submit the following application components as one packet, by email or by mail postmarked by Friday, March 29, 2019, to the address below. Applications will be accepted on a rolling basis. Letters of recommendation may be sent by the recommender. If you need assistance, please email SPPARK@uark.edu. The University offers more than 50 Silas Hunt Distinguished Scholarships annually to students from under-represented communities who have demonstrated outstanding academic leadership qualities and potential. The dean of the School of Law, Stacy Leeds, is the first American Indian woman to serve as dean of a law school. Dean Leeds’ predecessor, Dean Cynthia Nance, was both the first woman and first African American woman to serve as a dean of a school or college at the University of Arkansas. 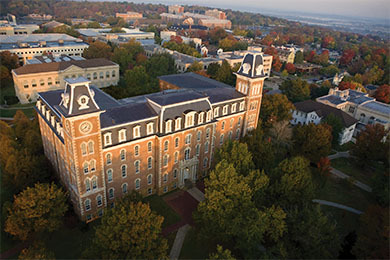 You can find out much more about the University through the University of Arkansas website.